It was a gift for our friend and he was ecstatic to have it! Works great and looks much more expensive! 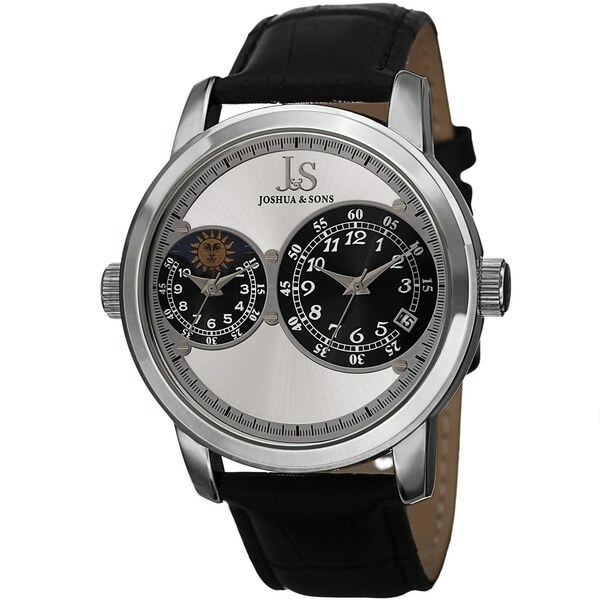 This striking man's watch from Joshua & Sons displays a sunray dial and AM/PM indicator. The leather strap and reliable Japanese quartz movement creates a sturdy timepiece. Featuring a date window, it is guaranteed to be a great addition to your wardrobe. Bought this watch for travel to different time zones. Great value for the price. Wears well and is very comfortable. I prefer the larger face of a men's watch. Very pleased with this purchase. I decided to get another one for my husband. Just like the picture. I bought it for my father as a Father's day gift. He loves it..great quality and fast shipping. I will definitely buy from this company again. Good purchases very nice and very good watch, thank Overstock!!!!!!!! I bought this for myself and I love it. I used to be attached to another brand. Not anymore.